Trumpeter Irvin Mayfield and New Orleans Public Library Officials announced a multi-million dollar plan today to rebuild the public libraries of New Orleans. The $650 million plan will begin with a branch featuring jazz, housing early recordings and reviews to honor the unique place of jazz in the history of New Orleans. Future branches will celebrate the culinary heritage, and the iron and woodworking traditions will be the focus of an architecture branch. The jazz branch will begin construction in the next two years and will be led by a $2 million contribution from the Bush-Clinton Katrina fund, with the remaining $10 million to be raised from various public and private funds. 19 of New Orleans’ Public Libraries’ 33 branches were damaged by Katrina and while all are open today, many are operating now in trailers or temporary housing. The musician’s story is emblematic of the spirit of New Orleans in many ways. 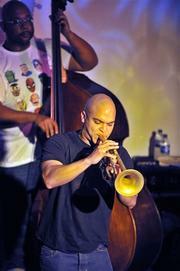 His father, Irvin Mayfield, Sr. drowned in Katrina. His body was found on Elysian Field aside Louis Armstrong Park. Music has been a part of his coping and healing process. He carries on doing good works that will honor his father and the music. He speaks of libraries as democracies where everyone has equal access to knowledge and jazz is democracy you can hear. His comments echo the sentiments of many New Orleanians today. No matter how excruciatingly slow the renewal is, no matter how sad they may be; they point to the positive. Mayfield points to the fact that in every school, no matter how dilapidated, students are still playing music. It’s a part of the culture that will not be drowned, not by walls of water nor by mountains of red tape. It makes perfect sense that the first branch to be built under this ambitious plan should celebrate the music that is central to the life of the city. Check out Mayfield at Snug Harbor on Frenchmen Street. Another musician playing at Snug Harbor regularly is Jesse McBride. Both Mayfield and McBride are making sure the music continues to be available for students to learn and grow through, and for for fans young and old to enjoy.